Do you know what these were a part of? Wow, what if we all pledged these things?? Imagine the transformation….. Seems you will be safe today! Good Omen I say. 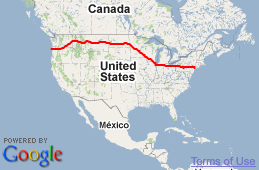 Minnesota is a very progressive state, or at least that was my experience there. Wonderful idea, and uplifting sentiments in the pledges here. Lovely pledges but I can’t help but wonder why the third part of the pledge only specifies guns. I guess knives are okay? A better pledge, I think, is to pledge not to harm another human being. I’m enjoying catching up on your adventure on a daily basis. I find your photos and comments (as well as other people’s comments) funny, thought provoking and inspiring. I love reading about your journey so much I think I need to create my own and follow through on it. Best of luck. Was the use of guns against other human beings such a problem in the area that they had to make a specific pledge for it? It doesn’t seem like Minneapolis would inspire such behaviour. Too funny! I love these! 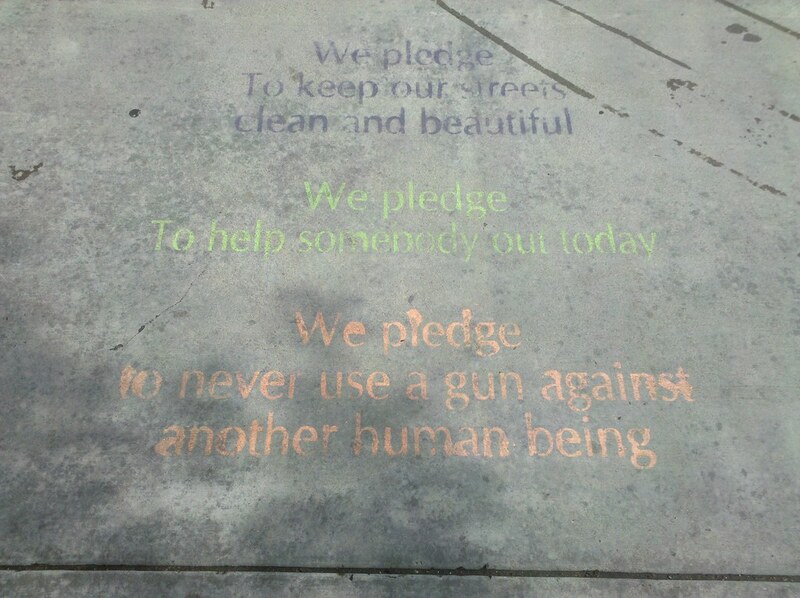 The irony of them though is they are spray painted on the sidewalk and the first pledge is to keep the streets clean! I was having the same thought, Brandy. If Minneapolis is such a “progressive” state then I wonder why such a regressive and non-inclusive statement is made… especially if it is on a public sidewalk and this doesn’t appear to be graffiti. First I’d have to say that “violence” of any kind is the real problem but guns have been used as “the” lone villain. And secondly, I’d have to say that the order in priority of the pledges is somewhat humorous. Thanks for such a wonderful image that certainly speaks volumes when you pause to look “beyond the sidewalk”. This is in one of the rougher neighborhoods in the city of Minneapolis, but there are a lot of great community leaders and activists that take pride in where they live and strive to make it a safer place to live. I guess I don’t exactly see the humor in this photo. Am I the only one that would stand up and fight for my country? It took guns to wrest this country from British control, and it takes guns on a daily basis to keep it so that people can write nonsense on their sidewalks without fear of reprisal. If not for guns this country would have been communist for the past hundred years, and Arabic Islam in the future. For those who do not care to use guns, please pray for those in the Middle East doing your fighting for you. Think univeral Peace… not Pacifism. Leo… I think you are missing the point. It has taken guns (and weapons in general) to gain and secure freedom…. BUT wouldnt it be nice if we didnt NEED guns (or weapons in general) to do so? If EVERYONE took the pledge not to use guns (or other weapons for that matter) against others then… NO ONE would need them. The world would just be at peace. Hence no need to “Fight” for our country… just live in the peace and freedom that we enjoy and everyone deserves. Just a thought. That’s what we call “la-la-land”. It doesn’t exist. As long as animals live (people are animals too) there will always be those that seek to inflict pain for one reason or another. This is not an issue of guns, or other kinds of weapons, it’s an issue of people being people. haha, are people really that gun-crazy in Minnesota that they have to be reminded constantly not to shoot at each other? This has inspired me to paint words on my back patio. How about ‘we pledge to never use our religion, our speech, the press, our freedom of assembly, or to petition the Government against another human being’? I mean, if we’re going to give up our rights, we might as well give them all up!!! Bullshi…. I am not going to read anything negative, into anything that has such good intentions. I love the sidewalk resolutions as a reminder of everyday living and giving. Doing the right thing. It was done in a tasteful manner.